Groovy Pondicherry, a union territory on the coast of Tamil Nadu in south India, is an enticing place to splurge on a hotel. If you have some cash to splash, you can stay at a beautiful beachfront resort just outside of town. Alternatively, there are plenty of atmospheric small hotels and guesthouses along the Pondicherry Promenade (bordering Rock Beach), and in the historic French Quarter next to the Promenade. These popular hotels in Pondicherry are near the beach and cater to all budgets. Note: If you're traveling with family or friends, check out Serenity Beach and Auroville Beach north of town for seaside cottages and villas with multiple bedrooms (many are listed on Airbnb). If you're don't mind staying out of town, the luxury Windflower is located around 20 minutes drive south of Pondicherry, between the tranquil backwaters and ocean at Little Veerampattinam village. It's perfect for those who are looking for a peaceful beach getaway. The resort has 51 rooms and villas. There's a swimming pool, and spa that offers fabulous rejuvenating massages and body treatments. Rates: From around 7,500 rupees per night. A little farther south of The Windflower, Le Pondy is a modern resort with the backwaters on one side and private beach access. The property is spread over 14 acres and has 70 rooms including eight presidential pool villas, eight luxury pool villas, 12 sea view rooms and 42 lake view rooms. Facilities include restaurant and bar, wellness center and spa, swimming pool, health club, library, games rooms, and kids' play area. This makes it an appealing resort for families. Rates: About 6,500 rupees per night upwards. The rustic Dune Eco Beach Hotel is one of India's top eco-friendly hotels and an inspiring hotel for artists. Set on a sprawling 35 acres of land fronting the beach about 30 minutes north of Pondicherry, it offers lots of privacy. The concept is unique: 55 cottages, all with a different designs from various artists and architects around the world. Many have been decorated by the artists in residence. Free bicycles are provided to ride around the property. There's a swimming pool and organic garden. It's pet friendly as well. Rates: From around 5,000 rupees per night. The Promenade is a luxury boutique hotel that's situated, as you'd expect from its name, right on Pondicherry Promenade opposite the statue of Gandhi. 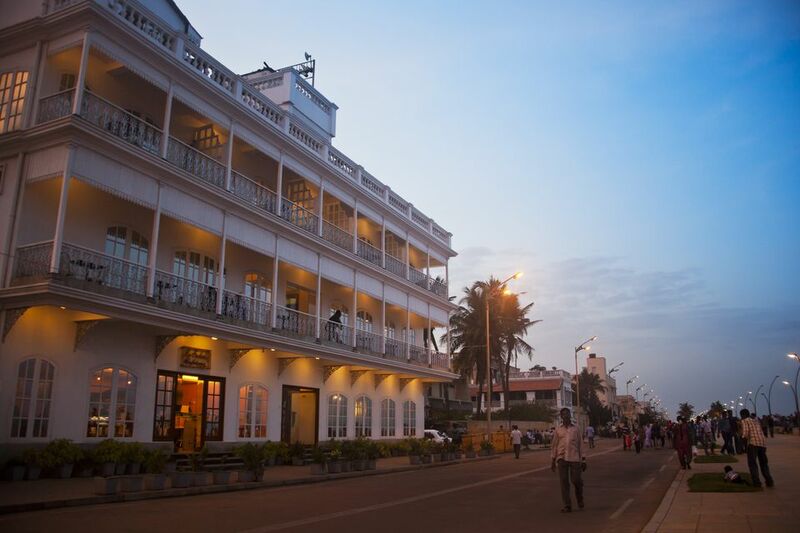 It's decorated in modern French style and has a fabulous rooftop restaurant with sea views over the Bay of Bengal. Plus, a happening new architecturally designed lounge bar called The Storyteller's Bar that holds live music performances. Excellent service, courteous staff, delicious food, and a swimming pool also make this place a winner. Rates: Expect to pay around 6,000 rupees per night upwards. Lotus Bay View is a popular budget option directly across from the beach. It has 15 reasonably priced rooms spread across four floors, some with private balconies and sea views, but no restaurant (room service is available though). An appealing thing about this hotel is that it has large suite rooms for families. Rates: It's often possible to get a sea-facing room with balcony for under 3,000 rupees per night. The standard rooms are priced at around 1,200 rupees per night upwards. It's all about location at this characterful heritage villa. It has an enviable position on Rue Saint Martin adjoining Pondicherry Promenade, not far from Sri Aurobindo Ashram, with some airy sea-facing rooms and a lovely garden courtyard. Unfortunately, it's not in the best condition though. The furniture is quite old and amenities are lacking. There's no restaurant on the premises but there are many excellent ones near the hotel, including 24-hour Le Cafe on the beach. Rates: From around 3,000 rupees per night. It's worth paying extra for a sea facing room. An intimate and relatively new hotel with 11 rooms, Cours CHABROL is enviably located right on Pondicherry Promenade with the French Quarter just behind it. The property is small but clean and comfortable, with helpful and efficient staff. The main drawback is that it doesn't have a restaurant, although room service is available. However, the views make up for it! Rate: Expect to pay 5,000 rupees per night for a deluxe sea facing room, including breakfast. Other rooms are cheaper. Palais de Mahe is a gorgeous CGH Earth property on Rue de Bussy in the French Quarter. It's undoubtedly the best hotel in the area and guests say it's impossible to find fault with it. The hospitality is superb, as is the renovation, which reflects the heritage grandeur of the property. There are high ceilings, deep verandahs, colonial-style furniture, and brightly painted pillars. The courtyard features a plunge pool and there's an Ayurvedic massage center as well. The restaurant is very popular. Rates: From about 12,000 rupees per night. The tastefully renovated Villa Shanti has a deceptively demure facade. Located on Rue Suffren in the French Quarter, three streets from Pondicherry Promenade, inside it is contemporary and chic. This boutique hotel has 11 rooms and four suites (one with its own private garden), all built around an inner courtyard with plenty of natural light, and arguably the best restaurant in Pondicherry. Rates: Around 5,000 rupees per night upwards. L'Escale has to be the best value budget stay in the French Quarter. Located on Rue Dumas, just around the corner from Pondicherry Promenade, this boutique guesthouse is newly renovated and attractively decorated in French provincial style. The terrace has a view of the ocean and breakfast is served there in the mornings. All rooms are air conditioned and have very comfortable beds. They don't have TVs though, and there's no restaurant or room service. However, there are plenty of places to eat in the vicinity. Rates: Starting from 1,800 rupees a night. It's worth paying a bit extra for an upper floor room though, to avoid people walking past your window. You'll get a balcony too. If you'd like to go a step up from budget guesthouses, you can stay a street away from the Promenade at La Closerie on Rue Dumas. The owner has gone to a great extent with the stunning renovation and redesign of this old colonial mansion, hidden behind a bougainvillea tree. It's been turned into a boutique bed and breakfast with eight modern rooms (some have a mezzanine level with an extra bed), quality furnishings, interesting ornaments and art, and plunge pool with Jacuzzi. value for money. Do note that this place isn't suitable for large families or young children. Les Hibiscus is perhaps the most popular guesthouse in the French Quarter. It's conveniently located on Rue Suffren, close to the Promenade. The owner is very kind and attentive, rooms are spacious and clean (and yes, they have TVs), and the decor is a blend of old world colonial charm and Indian. A tasty European breakfast is served, but you'll need to eat lunch and dinner elsewhere as there's no restaurant or room service. Rates: The guesthouse has four double rooms, each priced at 2,800 rupees per night plus tax, and a cheaper small single room on the rooftop.